The Long Island Neuroscience Specialists has renowned neurologic experts to properly diagnose your severe pain. Neck and back pain diagnosis aren’t always easy and can be difficult to pinpoint the exact cause. 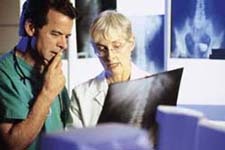 Your spinal pain diagnosis could be related to a number of different conditions ranging from osteoporosis, to herniated discs. Your pain history or any activities you’ve participated in that may have triggered your symptoms are important in diagnosis and treatment so be sure to notify us. What’s causing my back or neck pain? It’s a common question, and a visit to your doctor is an important first step to get an answer.